Despite the claims of Louis Van Gaal, Angel Di Maria is not a winger. At least not since he moved to Real Madrid in 2010. The image below shows a heatmap of the locations a genuine winger passes the ball from – this is the passing heatmap of Jesus Navas for Man City in the Premier League last season. Note how the hotspots in the heatmap typically run parallel with the sideline, and the majority of the orange coloured area is beyond the edge of the 18 yard box. During his first 3 seasons in Madrid, from 2010/11 to 2012/13, Di Maria was primarily a right sided player. 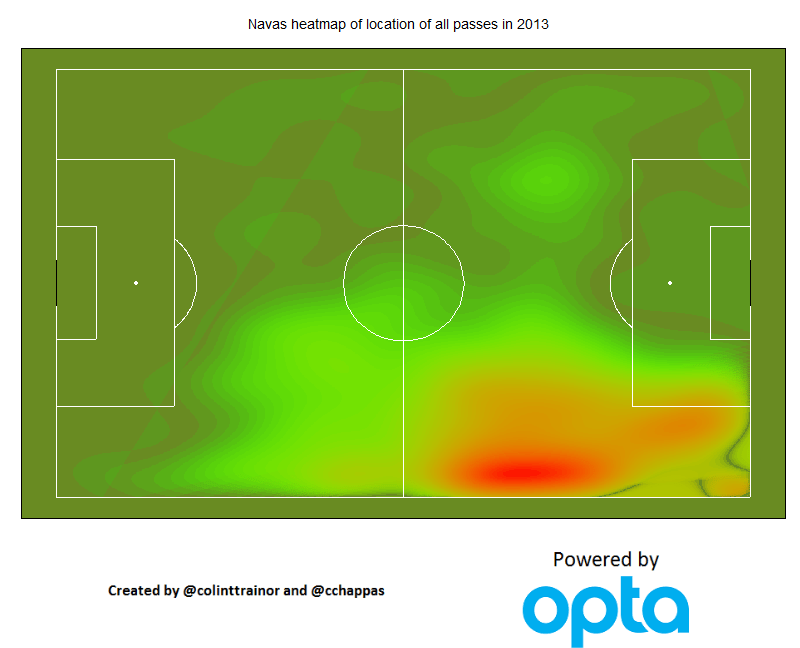 His heatmap for last season was totally different to the previous three, however none of Di Maria’s passing heatmaps look remotely like Navas’ from last season. As a wide player his hot spots are naturally close to the sidelines, but Di Maria is much more comfortable with coming in centrally before playing his passes. He also doesn’t have that many of his passes played from close proximity to the end line, certainly not compared to what we seen above with Navas. I mentioned that Di Maria’s role totally changed last season for Real Madrid. Following his excellent performances on Real Madrid’s left side, most notably in last season’s Champions League final, it is easy to forget that the Argentinian was actually based on the right side of the pitch for Real before the arrival of Gareth Bale last season. Having splashed out €100m on Bale, and with Ronaldo to also be fitted into the team, there was no way that Di Maria would be able to retain his place on the right side of the attack for Real. There were suggestions twelve months ago that he would be sold, but the sale of Mesut Ozil to Arsenal put pay to that notion. The end result is that Di Maria played quite a few games in the centre of midfield during the 2013/14 La Liga season, and his passing heatmap bears no resemblance to his earlier years at Madrid. The gif below shows the locations of Di Maria’s defensive touches (tackle, interception or foul) over the past four seasons. As expected, given his changed role last season, he had much more defensive responsibilities than before. These defensive heatmaps show up what is arguably Di Maria’s greatest strength; dropping deep to gain possession and then acting as the link man. He can be the out ball for his centre halves or central midfielders and is then very comfortable with carrying the ball forward before playing a pass forward to the heavy artillery up front. Di Maria is a hugely talented player, and has shown a willingness to adapt to whatever position is asked of him. I’m quite sure he’ll do a great job in whatever position Louis Van Gaal plays him. However, he shouldn’t be confused with what we would commonly consider to be a genuine old fashioned winger. He is not. Although he can whip in crosses, and racked up 17 assists in La Liga last season, he doesn’t attack the byline with the gusto of a true wide player. Di Maria is good enough to improve this current Man United team, almost regardless of what position he takes up on the pitch. In the event that van Gaal sticks with his preferred system of three at the back, Di Maria may be ideal as the wing back. However, perhaps he shouldn’t play the left wing back role, which is where I have seen a few people suggest he could play, as this is a position United have strengthened this summer with the purchases of Shaw and Rojo. I believe there is arguably a greater need for the Argentine on the other side. Right now, it looks like Antonio Valencia or Rafael is the preferred option for this right wing back position. Di Maria would be a massive upgrade on either of these if he returned to the right hand side that he patrolled so well for Real Madrid. A formation which played Di Maria at right wing back and one of Shaw or Rojo on the opposite side would allow van Persie, Rooney and Mata to remain as the front three. This would also enable United to have the ability to play two strong central midfield enforcers – if only they could find them.